Your search for Indiana colleges should start with Learn More Indiana provided by the Indiana Commission for Higher Education. The website has had some major revisions since I last visited. The most frustrating is the lack of a search option which means I can’t simply search for previous features to see if they have simply moved to a different part of the website. It appears that several items are no longer available including the listing of area events such as college fairs and FAFSA Days. There is a College Costs Estimator for Indiana colleges that allows users to save their results. The site passes on providing its own college information and instead refers students to the College Navigator and Big Future websites. In general, tt looks like users are likely to get more information from the Indiana Next PDF than the website itself. The Division of Student Financial Aid provides information on state grants and scholarships. This includes need based aid through the Frank O’Bannon Grant Program and the Part-Time Grant Program as well as the 21st Century Scholarship. Students can use the Indiana Career Explorer to track their Graduation Plan. This system also includes a career exploration component. Students planning on starting at a community college will want to visit TransferIn.net for a list of courses in the Core Transfer Library. The site also includes a map of all colleges in Indiana. 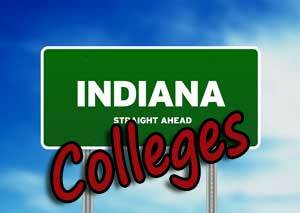 There are 41 four-year Indiana colleges with 500 or more full-time undergraduates. A total of 26 are private not-for profit colleges and 15 are public universities according to the Integrated Post-secondary Data System. Of the 203,671 students, 30% attend private Indiana colleges and 70% attend public universities. 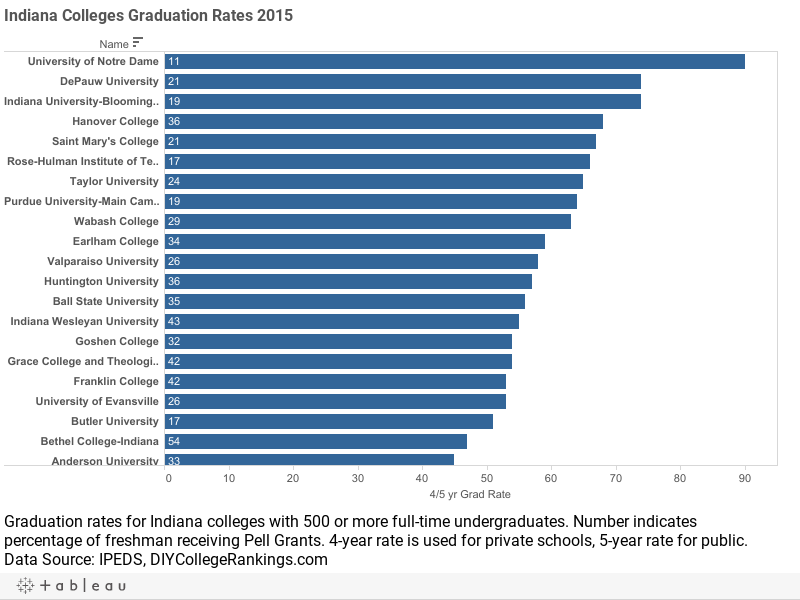 The private Indiana colleges have an average four-year graduation rate of 51.2% and the public universities have an average five-year graduation rate of 32.6%. 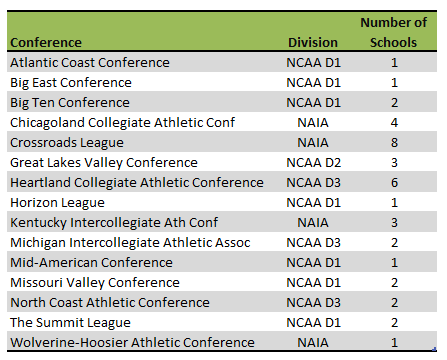 A total of 17 Indiana colleges meet the DIY College Rankings 50-50 profile requirements. College-bound seniors in Indiana had an average of 496 for SAT Critical Reading and 499 for the Math section. The 75th Percentile scores were 560 for Critical Reading and 570 for Mathematics. A total of 19 colleges had 75th percentile scores at or above this level.